This is comfort in a bowl. Make a big batch – it is great back-of-the-freezer fodder for emergencies. This is a milder curry but the fresh ginger still gives it wonderful nose-clearing capabilities. Place a large saucepan over medium heat and add the oil. When hot, add the onion and cook until soft and translucent (about 6 minutes). Add fenugreek seeds, cardamom pods and curry leaves and fry until toasted and fragrant (about 1 minute). Add the cumin, chilli powder and turmeric and stir until fragrant. Add the red lentils, coconut milk and stock and simmer until the mixture is creamy (about 20 minutes). Season with salt to taste. 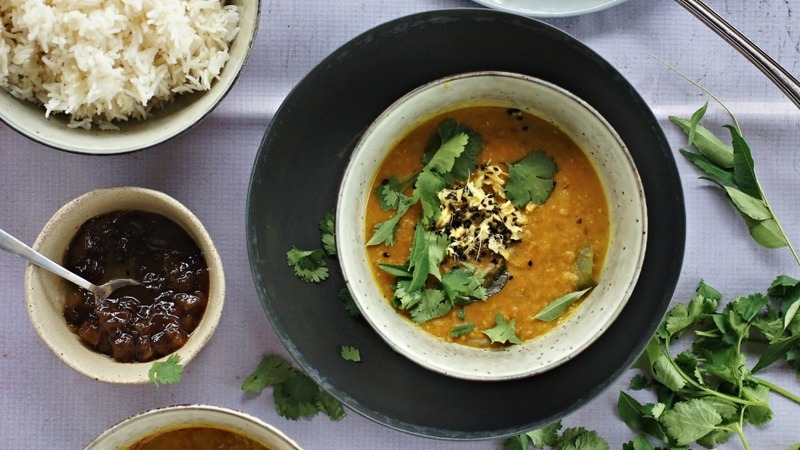 Ladle the curry into bowls, top with grated ginger, nigella seeds and coriander leaves. Serve with steamed rice and chutney.